Renting a dumpster for personal use is a lot simpler than you might think. 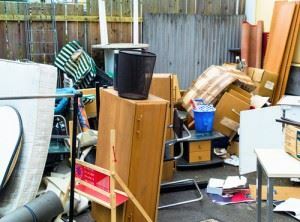 As your dumpster rental company in Cincinnati, Junk King takes care of everything but filling the container. Just tell our friendly customer service team when you’d like the dumpster to be dropped off and picked up, and we’ll be there when you need us. When we arrive, our crew will safely deposit the dumpster on your driveway or wherever you need it placed. Our Junk King MINI dumpster is an 8’ by 12’ box that is designed with residential use in mind. For heavy items, we recommend using the side door so you don’t have to hoist them high in the air. Try to break down bulky items that take up a lot of space (e.g. removing table legs or breaking lumber in half). Loose construction debris weighs a lot. Dirt, bricks, concrete, tiles, and roofing should only fill the MINI about one-third full. Avoid letting any junk stick out over the top of the container. You will need to remove them or break them down, or we may need to charge an overflow fee. What Are the Costs of Renting a Dumpster? Why pay for empty space in a dumpster? Junk King lets you pay per use! We offer lower prices for partly filled containers. When renting a dumpster from our Cincinnati competitors, they’ll charge you a maximum rate even if you only use half the box. Junk King’s pay per use dumpster pricing makes renting a dumpster more affordable for small projects. The JK MINI can handle sizable amounts of construction debris, but it’s also the easy and convenient solution for spring cleaning and junk removal. See our MINI terms and conditions for more details in plain language! We accept everything except hazardous waste. Junk King understands that you need to be able to dump pretty much whatever waste you have. Renting a dumpster from a company with a big list of prohibited items makes the whole process a lot less convenient. If you’re shopping around for dumpster rentals in Cincinnati, make sure that you choose a provider who accepts the type of waste you have. The only items that you can’t throw in a dumpster from Junk King are hazardous materials such as gas, ammo, paint, and fuels. Did you know that Junk King is the greenest junk removal company in the USA? Renting a dumpster from us means sending the majority of your stuff to recycling or donation. Junk King Cincinnati donates items to local organizations including the Building Value, New Life Furniture, and the Habitat for Humanity ReStore. Debris and materials that are recyclable all get sent to nearby facilities — including glass, metal, asphalt, lumber, textiles, and more. We send all the non-reusable items to be responsibly disposed of in Cincinnati area waste facilities. Rest assured that Junk King is committed to eco-friendly choices that you can feel good about when renting a dumpster from us! Whether you need Cincinnati junk haulers to come pick things up for you or you prefer renting a dumpster to fill yourself, Junk King is your #1 choice! People rent dumpsters for the same reason that construction crews love them: you can toss debris into the container throughout an ongoing project so you don’t have junk lying around. The most common purposes include home renovation, remodeling, landscaping, and cleanout projects. Not sure about renting a dumpster and filling it yourself? Already have a pile of debris or a room full of junk? Ask our trained team of professional junk removers to come to you anywhere in Southwest Ohio and haul it away. Book a Dumpster Rental Today! If you have questions about renting a dumpster, just let us know! Call (513) 206-8945 to talk to our Cincinnati dumpster rental team — or book online now to save $30! This entry was posted in Uncategorized and tagged Cincinnati Debris Removal, Cincinnati Furniture Disposal, Cincinnati Furniture Removal, Cincinnati Junk Removal on July 4, 2017 by Julian Torres, "JT". Last updated April 11, 2018 .